Andrew Jordan recorded the fastest time in free practice one at Thruxton and the reigning champion believes the longest standing qualifying lap record in the BTCC is a realistic target to aim for later this afternoon. MG driver Sam Tordoff was the first to punch in a representative time before Honda Yuasa Racing’s Gordon Shedden took over at the top. 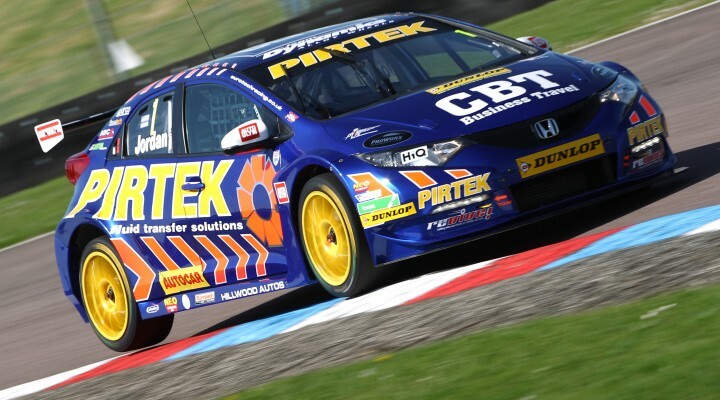 The Civic Tourer ran extremely well during Shedden’s longer run too, but ultimately it was to be Pirtek Racing’s Jordan that set the pace. Yvan Muller’s 2002 qualifying time of 1:16.369s has never been bettered, but a buoyant Jordan is confident of challenging the record during qualifying. The BMW of Colin Turkington completed the top three order, whilst Alain Menu made it four former champions in the top four. Menu won three times at Thruxton during the Super Touring days and with the VW enjoying its best ever round at the same circuit last season in the hands of Tom Onslow-Cole, big things are expected from the Swiss star and his team-mate Aron Smith this weekend. Irishman Smith endured a rather miserable session, however, with relatively uncompetitive times followed up by a crash late on, which brought a premature end to the session. Tordoff ended up sixth ahead of the second Civic Tourer of Matt Neal. WIX Racing’s Adam Morgan and Speedworks’ Tom Ingram followed in the time sheets, whilst seven-time Thruxton race winner Fabrizio Giovanardi rounded out the top ten. Aside to the session ending accident involving Smith, there was also a brief stoppage earlier on when the eBay Motors BMW of Rob Collard went off on the outside of turn one. Free Practice Two gets underway at 12:40 before qualifying commences at 15:55. You can listen to TOCA Radio via btcc.net throughout the day, whilst qualifying will be streamed live at www.itv.com/btcc. Click here to see the full classification.